We were blessed with a perfect day to explore Tulleherin. Photos of the Round Tower in recent years showed scaffolding around the tower. We were delighted that the scaffolding had been removed and this site proved to be well worth a visit. It is believed that a monastery was founded here by St. Ciaran of Saighir, a 5th-6th century Saint known as the patron and first bishop of Ossory, and that his remains lie in the "shadow" of the round tower. 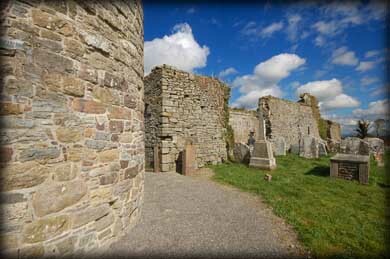 Tullaherin has been a site of great historical importance since its founding. 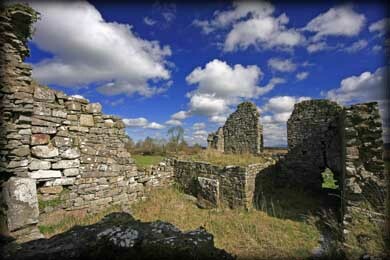 Although nothing remains of the earliest church, the remains of an 11-12th Century church consists of a rebuilt nave with antae, and an eastern chancel possibly added in the 15th C. A pilgrimage was once held here on St. Ciaran's Day (March 5th). The popularity of this pattern is demonstrated by records that there were at least 75 tents and stalls erected in 1800 to cater to the crowds attending. However, because of episcopal disapproval, all patterns including St Ciaran's died out in about the 1820's or early 1830's. Most astounding is that with the newly built church the site boasts continuous religious worship for over 1000 years! 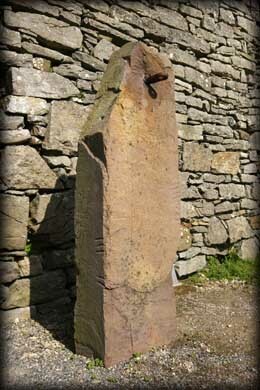 The first of two Ogham Stones at the site was discovered in 1852. What remains of this stone contains only 11 scores making the inscription incomplete. A second and larger stone (pictured right), with even less of an inscription, is believed to have been removed from the monastic site and used as a gate post on lands of Lar Mahon at Loughboreen until re-discovered in 1983 and returned to Tullaherin. The defaced stone now stands against the south wall of the church. Unfortunately we did not locate the first ogham stone but will return to photograph it soon. 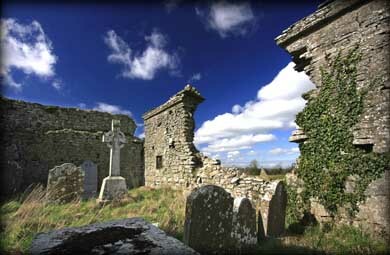 Situated: 15 kilometres south east of Kilkenny City. From Bennetsbridge take the Gowran Rd east, after 2 kilometres take a right turn. After a 1.7 kilometres take a left turn. Continue for 1.5 kilometres. The round tower should be visible on your right. Discovery Map 67: S 5910 4785 Last visit Mar 2011.